Stomach aches/cramps are a very common problem among individuals of all ages, and all genders. Stomach ache occurs when our digestive system is unable to digest the food we eat and therefore the digestive procedure remains incomplete. You can experience mild to sharp cramps in the stomach, abdominal pain, gas, vomiting, diarrhea and bloating. The common causes of stomach aches are indigestion, constipation, acidity, heartburn, stomach infection, menstrual cramps, overeating, food poisoning, lactose intolerance, urinary tract infection, stomach virus, food allergies, hernia, Pelvic inflammatory disease, kidney stones and appendicitis. Other causes includes fast food, aerated drinks, oily foods, canned and preserved foods, very spicy food and refined foods. It is very difficult to concentrate on anything, if you have a stomach ache. Some natural and easy home remedies can give you quick relief from this discomfort. 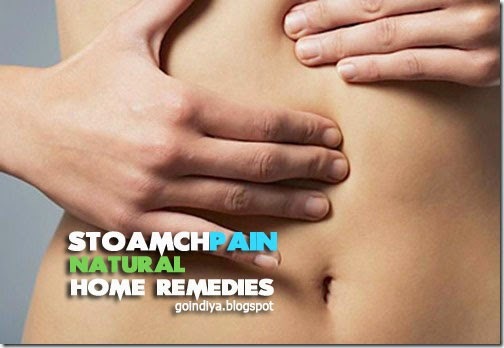 Here are some easy natural home remedies we recommend to seek fast relief from stomach aches. Apple cider vinegar helps in correct low stomach acid conditions which lead to indigestion, heartburn and constipation. Apple cider vinegar contains pectin fiber, which soothes the whole gastrointestinal tract, prevents stomach cramps, gas and bloating. It also improves your digestion naturally. 1. Mix 1 tablespoon of apple cider vinegar in cup of warm water and 1 tablespoon of honey, mix them well. Drink this mixture after every 3 hours until the stomach pain is gone. If you don’t have apple cider vinegar, then you can try regular white vinegar. 2. To improve your digestion. Mix 1 tablespoon of apple cider vinegar in glass of warm water with 1 tablespoon of honey. Drink this solution 30 minutes before your meal. Ginger is found very beneficial in fast healing of stomach ache. Ginger contains naturally chemicals called gingerols and shogaols, these natural chemicals can help relax intestinal track, and thus it relieve stomach pain. Ginger root is also beneficial in relieving vomiting. Ginger contains antioxidant and it has anti-inflammatory properties that help repair and regulate the digestive system. 1. Take 1 tablespoon of fresh ginger paste and add 1 tablespoon of honey in it. Consume this mixture 30-40 minutes before and after every heavy meal. This will reduce your stomach pain and also strengthen your digestive system. 2. Add 1 tablespoon of fresh ginger paste in 2 cup of water and boil it for 3-5 minutes. Then add 1 tablespoon of honey to it and drink it to get rid of stomach pain. You can also add 4-5 fresh mint leaves to boiling water along with ginger. This mixture is very beneficial for fast digestion. 3. Add 1 tablespoon of ginger paste to your regular boiling tea, also add 1 tablespoon of honey to it. 4. Add 1 tablespoon of fresh ginger paste and 1 tablespoon of fresh lemon juice in glass of water and also add pinch of black salt in it. Drink this mixture to get fast relief from stomach pain. Tip – Do not boil honey, add it afterwards. Take 1 cup plain yogurt and mix it with cup of water. Add pinch of salt and pinch of black pepper powder, also add some chopped fresh coriander leaves. Mix the ingredients properly and drink it after every heavy meal to get rid of stomach ache. Boil 1 tablespoon of dried chamomile in 2 cup of water for 10-15 minutes, strain the mixture and add 1 tablespoon of honey and 1 teaspoon of fresh lemon juice. Drink this mixture to reduce stomach pain. Repeat this 2-3 times a day. Fennel seeds contain a volatile oil called anethole, which stimulates the secretion of digestive juices for smooth and fast digestion. Fennel seed has carminative, pain relieving, antimicrobial and diuretic properties. It can also reduce inflammation, and lessens the stomach pain caused by it. In the gastritis inflammation, fennel gives you relief from the discomfort. Consumption of fennel seeds gives you lot of relief from other indigestion symptoms such as constipation, gas and bloating. 2. Take 2 tablespoon of raw or roasted fennel seeds and crush them to make powder of it. Add this powder in glass of water and boil it for 7-10 minutes. Strain the water and allow it to cool. Add 1tablespoon of honey to it and drink it. Repeat this t2-3 times a day to reduce stomach pain.